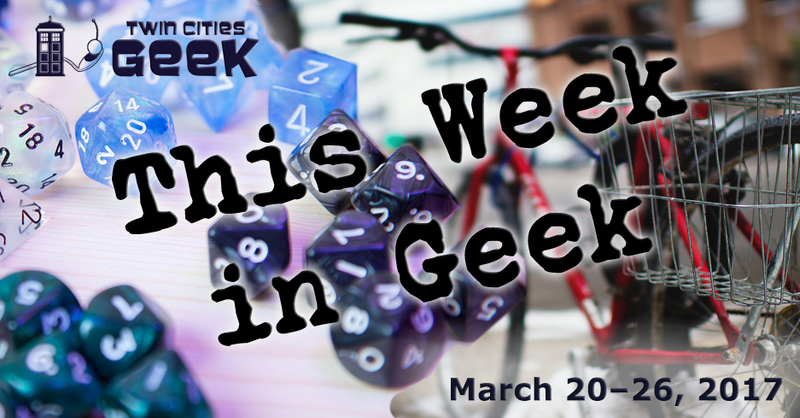 Welcome to This Week in Geek, your guide to events of interest to the Minnesota geek community for the week of Monday, March 20th through Sunday, March 27th. When: Monday, March 20th at 6:30 p.m. When: Tuesday, March 21st at 5:00 p.m. When: Tuesday, March 21st at 7:00 p.m.
Café Scientifique, presented by the Bell Museum of Natural History, is “a happy hour exchange of ideas about science, environment, and popular culture featuring experts from a variety of fields on diverse and often provocative topics.” This month’s theme is “Hunting Knowledge and Gathering Herbs: Rastafari Bush Doctors in South Africa” with Lisa Aston Philander, curator of the College of Biological Sciences Conservatory and adjunct assistant professor in the Department of Plant Biology at the University of Minnesota. When: Tuesday, March 21st at 6:00 p.m. The Minnesota Book Awards and Loft Literary Center present a celebration of this years finalist books. There will be a reception, a quick Q&A session with the finalists, and a time for wine, dessert and mingling. Come and experience YogaQuest, a blend of yoga and fanfiction storytelling led by certified yoga instructors. Experience a yoga workout experience and a story at the same time. Prepare yourself for the upcoming film, or just feel powerful, with this week’s theme: Power Rangers! When: Tuesday, March 21st at 8:30 p.m. When: Wednesday, March 22nd at 7:00 p.m. When: Thursday, March 23rd at 6:30 p.m. When: Thursday, March 23rd at 7:00 p.m. Experience a night of fun and exploration at Can Can Wonderland—the new minigolf course, bar, and entertainment venue recently profiled here on the site. You’ll receive a map upon arrival and will be invited to explore a world inspired by Lewis Carroll’s works. The night offers minigolf, smoking caterpillars, and more for $12. When: Thursday, March 23rd at 9:00 p.m.
Another event at Can Can Wonderland is its weekly variety show. The night will play out in four acts, with musical accompaniment from a house band and local celebrity hosts. You never know what you’re in for. This is a 21+ event. When: Friday, March 24th at 6:00 p.m. When: Friday, March 24th, and Saturday, March 25th at 7:30 p.m. When: Friday, March 24th at 10:00 p.m.
Don’t throw away your shot to enjoy a night of Broadway-themed comedy from Vilification Tennis. Learn comedy truths at Vilification’s most ambitions show in years! Tickets are $15 at the door or $12 in advance. Doors are at 9:30, show is at 10. When: Friday, March 24th at 7:00 p.m. and 8:30 p.m.
Take a deep dive into the world of 19th-century crime and punishment with this event put on by the Minnesota Historical Society. Learn about this world through court testimony, newspaper articles, and more, focusing on the case of St. Paul’s Ann Bilansky, a woman accused of murdering her husband. This event is intended for those 18 years or older, and tickets are $10 for adults, $9 for seniors and students; MNHS members get a $2 discount. Lounge 2.0 is a get-together for people who are passionate about games and want to spend their Friday nights in like-minded company. Glitch offers consoles, PC stations, and tabletop and digital games. If you’re passionate about a game, bring it to share with the community. When: Friday, March 24th at 8:30 p.m. When: Saturday, March 25th at 10:00 a.m.
Come on down for a fun meetup and 10k with Gryffindorks and the Hogwarts Running Club. Preregistration and new sock donations for the House Elves are recommended. When: Saturday, March 25th at 4:00 p.m.
Anime Twin Cities is partnering with Funimation for an exciting double screening of The Boy Who Leapt through Time and The Boy and the Beast, both award-winning films from Mamoru Hosoda. This is a free all-ages event, with popcorn for 25¢ and other snacks at similar prices. When: Saturday, March 25th at 5:30 p.m. The Minnsky Theatre will be hosting an evening to celebrate the release of A Field Guide to Dragons, Wyrms, and Serpents of the World. There will be a cocktail hour, a book signing, readings from the book, circus performers, dancers, and a meet and greet. When: Saturday, March 25th at 7:00 p.m.
Come bid adieu to Sidhe Brewing Company, which is closing its doors, with a night of music from the Alein Whalers and Bardmageddon. Enjoy the music and the beer for a last time. Come and see competitive roller derby for Bout 4: Purple Rain. Tickets range from $10-15 for this night of fun for all. The Banger Sisters will be matched against the Violent Femmes, and Delta Delta Di will face off against the Kilmore Girls, for a night you won’t soon forget. When: Sunday, March 26th at 10:00 a.m.
Mead Hall Games in South Minneapolis is hosting an event for local comics creators to let people get in touch with the local scene. All types of creators are welcome to this free and family friendly event. Feel free to bring some of your work to share. When: Sunday, March 26th at 1:00 p.m.
Quatrefoil Library is hosting a get-together for women writers and their fans. Writers this year include Catherine Lundoff (profiled here on TCG last year), Mary Stein, Kirstin Cronn-Mills, and more. The event will begin with a reading, followed up with a time for book signing and conversation. When: Sunday, March 26th at 2:00 p.m.
Artstart and ArtScraps present an afternoon of fun for the whole family centered around a concert. The event posits the question of what would happen if the characters from Star Wars were to attend a classical music concert. Unique concept aside, this event includes art activities, dancers and a concert. When: Saturday, March 25th at 11:59 p.m. When: Sunday, March 26th at 12:00 p.m. When: Sunday, March 26th at 12:45 p.m.